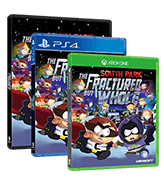 Created, written, voiced, and directed by Trey Parker and Matt Stone, South Park: The Fractured But Whole is authentic, interactive South Park at its finest – hilarious, outrageous, and a whole lot of fun. Everything is bigger, longer, and goes deeper than before. Come on down to South Park and have yourself a time.